In central Ohio it’s not quite autumn but with daylight too quickly losing the battle to the setting sun it would be hard, even on a warm day, to mistake it for summer. Plants, animals, insects, weather, and daylight are all in all in a state of flux. It’s as though we’re passing through on our way to somewhere else, to a place that’s easier to put a label on. It’s hard to bring oneself to the realization that present forms of life are dying but such an awareness is inescapable as one walks through the woods. It is a season of paradox as late summer and fall wildflowers arrive doing their best to announce the autumnal fireworks to follow. Caterpillars active just a few weeks ago have disappeared in preparation to reintroduce themselves next year in a new perhaps more beautiful form. Highlighted by the early morning dew, spider webs are everywhere often to the detriment of passing grasshoppers which seem more plentiful now. Other insects continue to make their daily rounds without the urgency of the squirrels which all seem to have a nut in their mouth. An occasional migrating warbler is seen making its way south while blue jays and crows are noticed more often just passing through while others have undoubtedly taken up residence for the winter. Tree Swallows, Prairie Oaks Metro Park. A very fresh Monarch, (Donna). Goldenrod, Prairie Oaks Metro Park. Killdeer, Prairie Oaks Metro Park, (Donna). A slightly tattered Viceroy, (Donna). A Banded Garden Spider gift wraps it’s prey, (Donna). A male Widow Skimmer, an easy to photograph and fairly common dragonfly. A hint of autumn along Big Darby Creek. Unlike summer, with days that change little from one to the next, it’s a time of year that assigns value to what we have and blesses us with a feeling of gratitude for what soon will be lost. 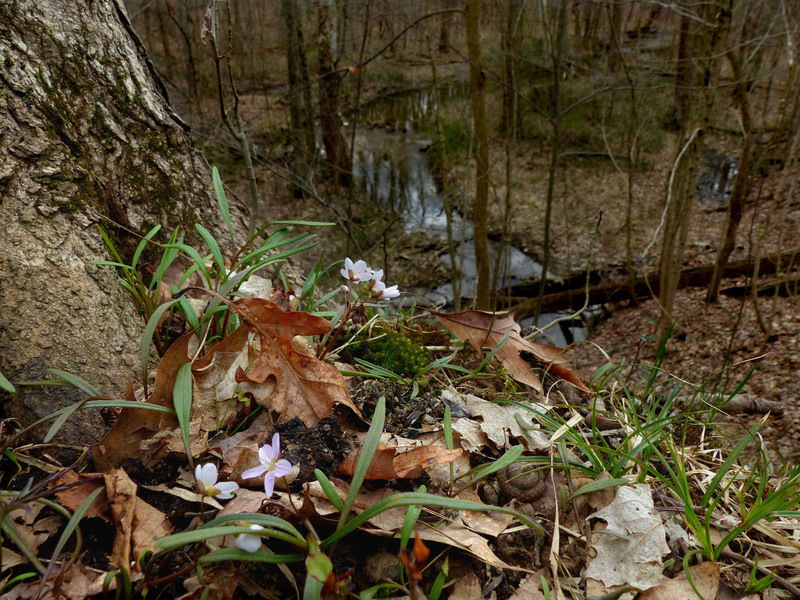 March 30th, perhaps it was time to check out O’Shaughnessy Nature Preserve and see what early spring wildflowers might be making their presence known. After all we don’t want to miss anything. Having said that, this time always leaves us feeling a bit impatient as spring always seems to progress so slowly and often heads in the wrong direction. A Beech Tree adds color to the early spring landscape, (Donna). Upon closer inspection we find other color in what is still mostly brown. Standing out in the stark landscape, a fallen trees creates a shape that fascinates when not looking for small flowers. Some flowers seen are unfortunately escapees from someone’s yard. With Twin Lakes in the distance, the foreground flower make for a beautiful scene, that is until you realize it’s invasive Lesser Celandine. In a vernal pool the frogs were strangely quiet considering the time of year. We did discover a few native wildflowers. Looking at the still leafless canopy it’s a race against time for early spring ground plants that call the woods home. The small blossoms on a Spice Bush. We will continue to mark the season with visits to wooded areas near our home. The Trout Lilies, both yellow and white, should be blooming any day now. Spring Beauties stand guard over the creek below, waiting for the Trout Lilies. During a recent trip to Georgia cooperative weather allowed us to get the canoe in the water and do some exploring on Lake Sidney Lanier. The lake is huge with large parts heavily developed due to it’s close proximity to Atlanta. However the area we choose to explore by starting from Don Carter State Park is not as developed and as a result has many interesting coves and inlets to explore. In the last couple of years the region has been blessed with plenty of rain so the lake level has stayed near summer pool. A few years before that the area was suffering from draught conditions and the lake level was down in excess of 10 feet. Not much fun for paddling. The idea was to look for wildflowers and warblers. While we were treated to a bald eagle flying overhead, just out of camera range, we didn’t have much success with flowers or warblers. However, we did see butterflies and a rather rare one at that. Entering one of Lake Lanier’s many coves. The leaves were just starting to come out. Soon another smaller butterfly joins the Eastern Tiger Swallowtail and Duskywings all looking for some valuable nutrients from some type of bird droppings, perhaps from a Great Blue Heron? My wife moves closer for a better look. It’s a rare Harvester Butterfly! In it’s larval stage it feeds on aphids making it the only carnivorous butterfly in North America. We turned away from the butterflies for a moment to notice an Eastern Box Turtle cautiously observing the proceedings. Not far from Lake Lanier, in the woods behind the family home, we did discover some new to us wildflowers and a few birds were also seen. Wood Thrush, a bit too far away for a good shot. Hermit Thrush, also a bit too far away. . .
Back in Ohio, hoping for better luck, we continue our quest for spring warblers. Yesterday morning we enjoyed a 6 mile hike with friends at Battelle Darby Creek Metro Park. Everything was coming to life with numerous wildflowers including Trilliums and Celandine or Wood Poppies along the trail. Later in the day we decided to see what warblers could be found along the reservoir in Griggs Park and the area below the dam. Several people stopped to ask what we were looking at as we peered up into the trees. One or two were fellow birders with binoculars which is always encouraging. The number of warblers seen exceeded our expectations. Redbuds, other flowering trees, and wildflowers were making an already cheerful day even brighter. Redbud, along the Scioto below Griggs Dam. The Map Turtles were definitely taking advantage of the warm afternoon sun. Bigger Map Turtles on a smaller rock. It wasn’t hard to imagine a Smallmouth Bass just below the surface. Green is now winning out over the colors of winter. Sycamore along the Scioto River below Griggs Dam.